At this workshop, staff from OPR will present highlights from the new guidelines and lead a discussion of best practices in general plans around the region. 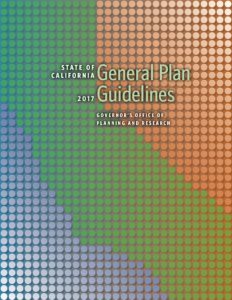 The Governors Office of Planning and Research (OPR) General Plan Guidelines (GPG) update was released August 2, 2017. The guide is the first comprehensive update in fourteen years and includes legislative changes, new technical advisories, guidance documents, and additional resources.